But we’re getting ahead of ourselves, so let’s rewind. “Colorful” is a game that may lead to controversy, as you are literally keeping your character at his happiest by making him take pills – while avoiding overdosing of course! But make no mistake: Just because a game about it was made, it does not mean that taking “happy pills” is a good thing. Not one bit. It’s a game, real life is different. Be sure to keep that in mind when reading this. It’s a simple game, featuring retro-style graphics along with what I believe is called “chiptune” music, and basic controls – left, right, jump. Though let’s not forget: Super Mario Bros. wasn’t exactly a complicated title either, yet we all loved playing that! So simplicity is not a bad thing, if done right – and in this one it works to the game’s advantage. Controls are tight and responsive, which is a necessity with a game like this, so you won’t be able to blame failing that one jump on the controls here..
You could try blaming Dave, the character you’re in charge of, however.. but I would recommend against trying that. He needs his medication to stay happy for a reason, and no one really knows what will happen if he gets cranky! We could have a crazy person with anger management issues on our hands for all you know, as the game never truly details him. But there’s more to it than tight controls – Dave has to deal with quite a few obstacles, as you take him through the levels. 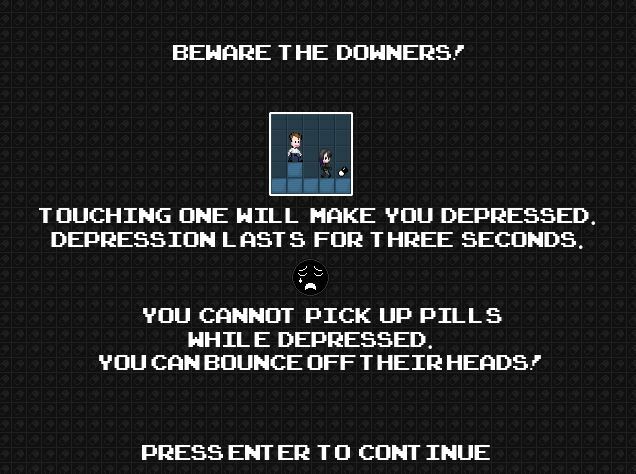 These range from more or less simply tricky jumps to lethal spikes and “downers”.. guys who have nothing better to do than to bring your happiness level down. The nerve of some people! (Hint: Avoid them). This guy sure gets around fast, provided you keep his happiness level high that is, ’cause once he’s a big smiley, you may have a hard time controlling him as his speed doubles. On top of that, as mentioned earlier, there are several obstacles to deal with.. and that certainly doesn’t get easier at super speed.. poor Dave. Wouldn’t want to be in his shoes. Trying to dodge “downers” is one thing, but why would someone place spikes between this guy and happiness, even if it’s drug induced? Doesn’t seem quite fair, so.. good thing it’s only a game! 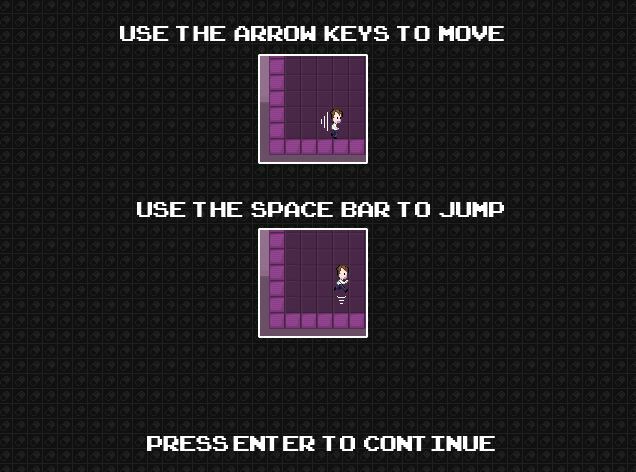 The tutorials in games these days aren’t always of great importance – especially for seasoned gamers, but this one I highly recommend taking a look at, and it’s only 6 levels long. Short and to the point, just like the rest of the game, here you learn about the various obstacles you’ll be facing in the game’s main mode. But just like many other 2D platform games – Super Meat Boy, VVVVVV and BIT.Trip Runner come to mind – it’s even entertaining through the frustrating mistakes as poor Dave faceplants on a spike or overdoses; though I must say there were times when I thought the game was changing the rules on me at random.. which was obviously not the case – it was just rather challenging (or in plain english: I was looking for an excuse for sucking at the game 😛). So I restarted the level over and over again, thrilled as the “next level” screen popped up with the funky music blasting in the background celebrating my victory with me. Waitaminute.. I forgot to tell what “Score Panic” is! 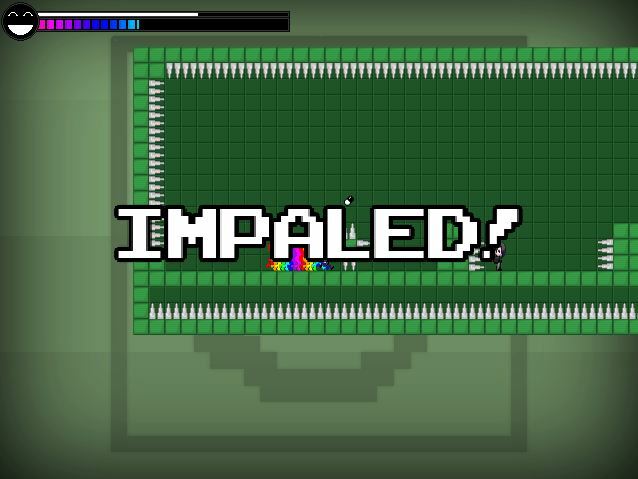 In the tutorial, your biggest challenge is getting all pills without dying while learning about the various mechanics presented throughout the levels in a safe environment before you’re thrown headfirst into the lion’s den; simple enough.. just how a tutorial should be. In “Score Panic”, the rules are changed.. now it’s not just a matter of making it through a level in one piece, while collecting all the pills! Nope, that’d be too easy now that you’ve graduated from Tutorial college and everything; instead the game tasks you with making the most of every single pill – ’cause if you want that high score you have to time Dave’s happiness so it’s highest when the countdown reaches zero. This may sound simple, but trust me.. it’s not. Doesn’t mean it’s not fun though. Just takes some getting used to, learning the layout of each level and timing it all just right to get that high score can become an addiction all on its own; though not one involving colorful racing around the area.. let’s leave that to Dave in his very very strange world. Spikes, “downers”, fragile blocks, sticky blocks, ghost blocks and whathaveyou. With 60 levels to zoom through, you may be able to finish this in one sitting.. but if you want a good score too, be prepared to replay the same levels over and over again. But the show ain’t over just yet..
On top of those 60 levels, the game makes use of custom levels/community content which – fanbase willing – should help extend the longevity. There’s plenty bang for your buck even before delving into fan-made levels though, especially at the low price of $5 since it’s free on Desura. If you’re not sure this is your kind of thing yet, there’s a demo too; where you get to play both the entire tutorial along with the first 10 levels of “Score Panic”. That means the developer is basically offering 1/6 of the game for free (in the demo), hoping people will find it worthy of five bucks to get the last 50 levels too. I’m only about half through it, but I already feel I’ve gotten my money’s worth.. good job NAMKCOR.